Professionals who stand out in today’s business world are those who have mastered the ability to build trusted client relationships. 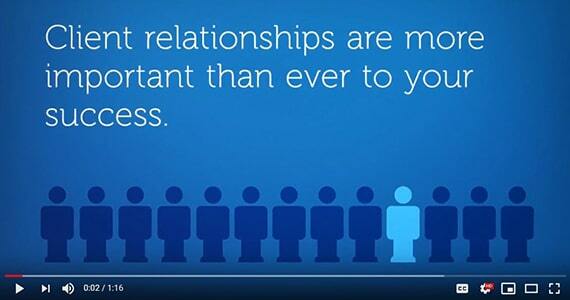 With certain technologies making business interactions void of personal touch, the rules have changed. Expertise is essential, but clients seek out those advisors they have confidence in and know they can depend on. Constant changes in today’s global climate greatly increases the demands on executive search and leadership consultants to deliver solutions to clients faster. In this webinar hosted by AESC and Cornell University, learn what trusted advisors can do to demonstrate innovation to senior talent decision-makers and hear directly from past participants on how the certificate has shaped their career and added value to their relationships with clients. 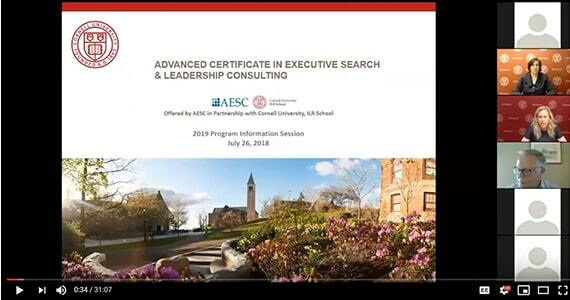 Hear from AESC, Cornell University faculty and program alumni on the value of the Advanced Certificate in Executive Search and Leadership Consulting. In this webinar, you'll understand how the Certificate will benefit your professional development, the benefits of having classmates from around the world, and much more. 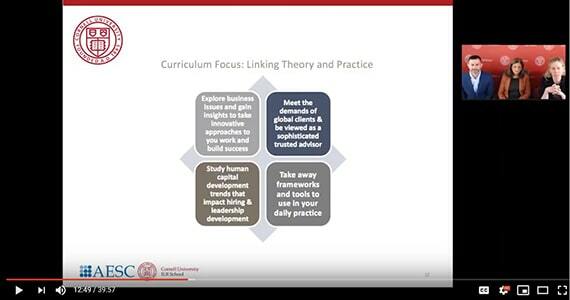 With our September 2017 start date fast approching, we connected for an insightful Q&A with Gwyneth Dobson, Director, Executive Education-Human Capital Development and Karen Siewert, Executive Education; both of whom represent Cornell University, ILR School. AESC is building on its existing relationship with Cornell University's Industrial and Labor Relations School (ILR) to provide a six-month MBA-level virtual certificate program designed exclusively for senior-level executive search and leadership consultants. We caught up with Donna Sharp, Director of Cornell University's ILR School, to discuss the program.